One of our favorite things to do in the summer is barbecue, and one of our favorite things to barbecue is pizza. 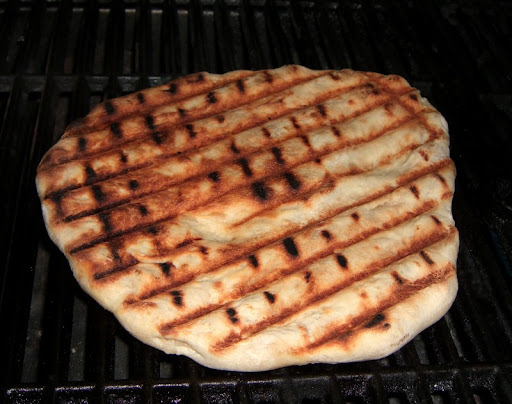 If you don't have a pizza oven or a tandoor oven (and I'm guessing you don't), the best way we have found to make good flatbread is on the barbecue. It works much better than using a conventional oven, even if you use a pizza stone. Arugula and prosciutto is a classic combination. If you look at the photo closely however, you may notice that there's watercress, not arugula on the pizza. We were out of arugula, but the watercress worked nicely as would any slightly peppery green. One of the best things about this pizza is that instead of a sauce, caramelized red onions form the base. They're savory, but slightly sweet, and sort of melt away when you take a bite. When it comes to dough, we're usually lazy. Trader Joe's sells some very good plain pizza dough (they also sell an herbed version, which is useful if you are just making flatbread as a side). We generally make two pizzas with one batch of dough. We use our gas grill since it's convenient and very easy to control. We heat up both sides to get it hot, hot, hot, but then turn off one side for perfect indirect cooking. The resulting crust has a tender, chewy interior with a lightly charred, toothsome exterior. The ingredient list is enough for 1/2 a batch of prepared dough. On a lightly floured surface, shape the dough into a ball and let rest 20 minutes. Heat a saute pan over medium heat. 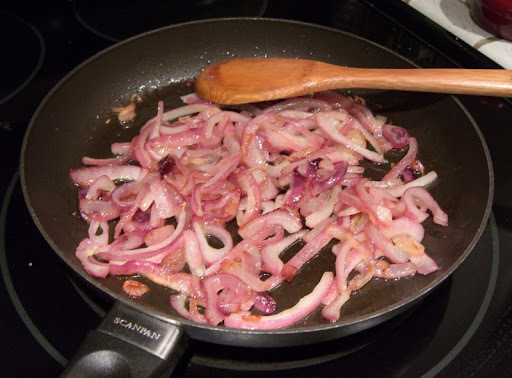 Add the 2 tablespoons olive oil, onion and a pinch or two of salt. Cook, stirring occasionally until the onion is soft and lightly browned, about 30 minutes. After the dough has rested, shape it into a thick disk, about 4 or 5 inches across. Let rest another 10-15 minutes. Make sure the barbeque grill is very hot. When ready to grill, turn the heat off on one side. Stretch the dough gently and evenly into a rough round about 8 or 9 inches across, then brush with olive oil. Carefully lay the dough on the grill, oil side down, away from the flame. Bake covered for 5 minutes, then using tongs, rotate dough a quarter-turn and cover again. After another 5 minutes, turn on all burners again. Brush the dough with olive oil and pat down any large bubbles. Flip the dough over onto the hotter side of the grill, then turn off the heat under the crust. Spread the onions and mozzarella around the crust and bake, covered for 5-8 minutes. 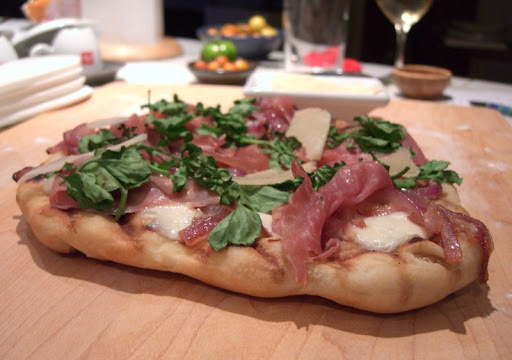 Scatter the proscuitto, arugula and parmigiano over the pizza, then close the lid for another 2 minutes. Slide the finished pizza onto a small cutting board. Let rest 3-5 minutes, then cut into wedges with a sharp knife. Serve hot or at room temperature. When the bbq is hot and just before it's time to cook, make sure the grill grates are quite clean (scrub with a metal brush if necessary) and oiled. I normally grab a wadded-up paper towel with metal tongs, dip the paper into a small dish of canola oil and quickly rub it over the grates. Rotate the towel and dip again as needed. Work quickly to keep the paper from igniting. this is my favorite pizza...however I also like it with fresh figs(when available) or I mix a little garlic oil with fig preserve, salt pepper and use that as my base, then caramelized onion and a little gorgonzola, topped off with burrata,prociutto and finally arugula...quite simply devine!! !